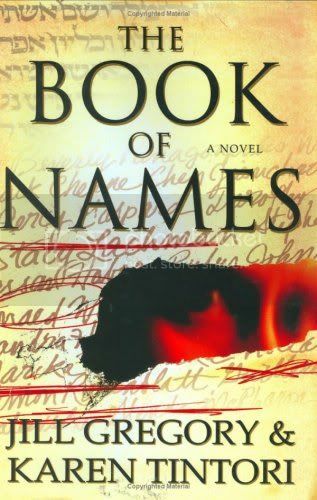 The Broke and the Bookish : Julia Reviews "The Book of Names"
Julia Reviews "The Book of Names"
I was strolling through the library's audiobook section when I came across a small collection of books on CD. This collection held the books that were in the mp3 format, thus fitting a whole book on one CD. Gripping onto the fact that I would not have to change CDs in stop-and-go traffic, I really wanted to find one I liked. There were not many to chose from but the blurb on the back of The Book of Names sounded really interesting. Within each generation, there are thirty-six righteous souls. Their lives hold the key to the fate of the world. Now someone wants them dead. When a childhood tragedy comes back to haunt Professor David Shepherd, he finds himself in possession of knowledge that holds the world in a delicate balance. He uncovers the Book of Names---an ancient text originating with the biblical Adam, and thought lost to history forever. By Kabbalistic tradition, the book contains the names of each generation’s thirty-six righteous souls---the Hidden Ones---by whose merits alone the world continues to exist. Legend holds that if all thirty-six Hidden Ones were eliminated, the world would meet its end. When the Hidden Ones start dying of unnatural causes, the world grows increasingly unstable: war in Afghanistan, massive flooding in New York, brutal terrorist attacks in Melbourne, a tanker explosion in Iran. David finds himself battling against the Gnoseos, a secret religious sect whose goal is to destroy the world by eliminating all of the righteous souls. David’s involvement quickly turns personal when his stepdaughter’s name is discovered to be one of the endangered. With the help of a brilliant and beautiful Israeli ancient texts expert, David races to decipher the traditions of the Kabbalah to save the righteous souls, his stepdaughter, and perhaps the world. This sounded like just what I needed. An action book filled with mystery and twists. it started off great! I was really interested in the mystery. David was likable as a main character. Things started off with some action. But having read all of the Dan Brown novels (that pertain to Robert Langdon anyway) comparisons were bound to happen. Frankly, I became bored after awhile. Not enough action was taking place to keep me engaged in the story. There were too many side plots, with people I didn't care about entering in for a minute of reading or so with seemingly nothing to add to the plot whatsoever. The book was full of cliches, even more so than a Dan Brown novel (which while I make this sound like it is a bad thing, Angels and Demons is one of my top 5 favorite books. Take that as you will). The climax was, in a word, meh. Honestly I expected more. It just seemed thrown together. Some parts in the plot made me wonder how no one at all before David had ever thought of putting two and two together. I mean really. At least with Langdon he was some sort of expert in his field. David doesn't know much about Jewish anything outside of what he learned when he was younger. I on the other hand only knowing the barest little about Jewish history that I learned in my religion classes growing up, figured things out before him. So why did not the Jewish leaders figure this all out first? It makes no sense. All in all, it wasn't a complete waste of my time. It was slightly entertaining and I finished it (which already makes it fare better than The Girl Who Loved Tom Gordon. So two stars for this mediocre attempt at a cool religious thriller. Awful how we sometimes forget how long it is since we visited our blogger buddies so I thought I'd stop by and say a big hello. Such a shame that you were disappointed by this book,it sounded so wonderful. As for The Girl Who Loved Tom Gordon, I certainly have to agree. That one was terrible. Sorry this one didn't turn out so great either, the synopsis sounded good! Jessi Spooked By "The Shining"
Regarding Jana and "Black Swan Rising"
Fictional Crushes: Jen's Top Ten Tuesday List! Jessi Reviews "The Stolen Child"